On April 30, 2018, I will be moving my office and merging with the practice of Dr. Joseph Breitman at 8021 B Castor Ave., Philadelphia, PA 19152. The office email address is drjosephbreitman@aol.com and the new office phone number is 215 728 1696. (You may also contact me at saulmillerdds@aol.com) The wheelchair accessible office is conveniently located one block north of Rhawn St., and it has street parking, a free rear parking area and a bus stop right at the corner. Dr. Breitman, an associate professor of prosthodontics at Temple’s School of Dentistry, maintains the highest standards, and his commitment to excellence has been nationally recognized with the 2014 ACP Private Practice Award. He is among the finest and most qualified dentists in the area and has been recognized as a Philadelphia Magazine Top Dentist. I certainly hope you will continue your dental care with us in Dr. Breitman’s office so that you can be assured of continuing the quality, care and integrity that is so important for your dental health. In addition to prosthodontics (crowns, partial dentures, complete dentures, implants, etc. ), general dentistry and other dental specialty services are performed in this office. Also, I am delighted to inform you that Rita Zeitone, my assistant for more than 27 years, will also be joining Dr. Breitman’s excellent staff. Both Rita and I, along with Dr. Breitman and his team, look forward to seeing you for your future dental care. For your convenience calls to Dr. Miller’s current office number, 215 624 4564, will be forwarded to Dr. Breitman’s office. This will continue for a limited period of time. 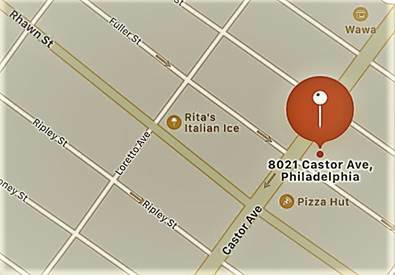 MAP TO 8021 B CASTOR AVE. If you wish to select another provider, please contact Dr. Breitman’s office at 215 728 1696. 3. Your union or HR dept. Again, thank you for allowing us to care for you.